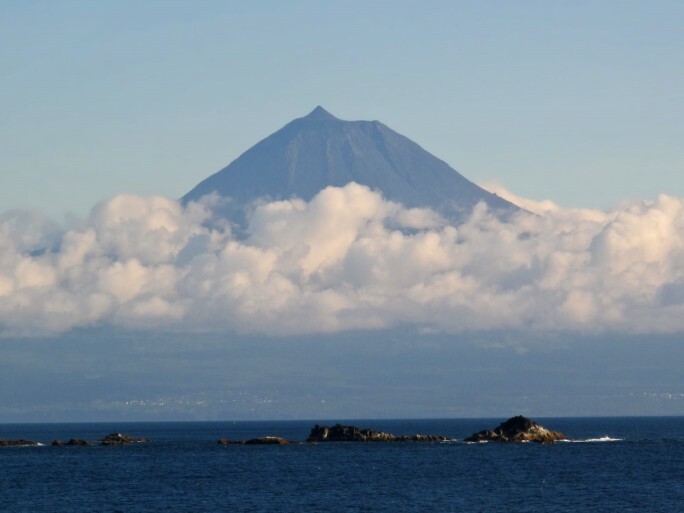 No one knows exactly when the gorgeous islands of the Azores were discovered, nor by whom. Located 1500 miles away from Europe and 2400 miles away from the American continent, they have been literally an oasis for everyone wondering in the Atlantic Ocean, from medieval explorers to modern travelers. I stepped on São Jorge, an island of the central group of the Azores, in June after traveling by ship for 17 hours, from my base, the island of São Miguel. The trip was more interesting than I could have ever imagined, as I found myself on a Greek ship, having lunch with the Greek captain and many members of the crew who were equally surprised and happy to welcome aboard someone from their homeland. I tipped my hat to my country’s flag on the deck along with 12 more people from all around the world. The island was waiting for us to explore it, though it was already 8 o’clock at night. We managed to rush into the supermarket before it shut down and have a marvelous dinner with the grand vista of the highest mountain in Portugal: Pico. The dormant volcano, wrapped around by the sunset’s red colors created a feeling that we were in the right place. And that was just the beginning of our astonishing journey. It didn’t take us long to meet a local and ask for information. However, people from São Jorge don’t just give information. They offer you any help possible, and that’s how all 12 of us, backpacks included, were packed in a guy’s car who told us he would show us the best place to camp. He was true to his word after 20 minutes and all I remember from the rest of the night is the warmth of the campfire and the toasty feeling of my sleeping bag. The next day, I woke up early because of the sun. 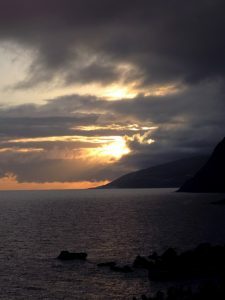 If you live in Azores for a while, you learn to appreciate every sunray that manages to get through the clouds. I was lucky enough to get 15 minutes of sunshine, lying on the grass, surrounded by thousands of mint plants. When everybody woke up and got ready we started walking near the road, hoping somebody will pass and pick us up. We were lucky enough to encounter a smiling farmer who drove us to Norte Grande and showed us the most typical geological feature of the islands: the “fajas”. The fajãs are small agricultural pieces of land near the sea, naturally formed by lava flows or landslides. All fajãs are beautiful but one has something in particular: there is no road to reach it but a very small path, there is no electricity but still there are people that live in a magnificent tiny village there. 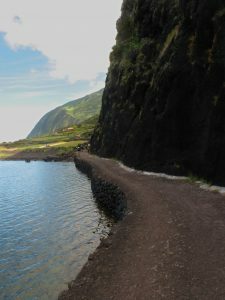 We reached Fajã da Caldeira de Santo Cristo after some hours of walking with some harsh pain in our feet, back and shoulders that no one mentioned· grumbling had no place all around that great landscape and scenery. We were more than welcomed by the people there, who showed us where to camp, gave us wood for the fire and spread the word about our stay to the whole village. After some time we all gathered around the fire, with some bottles of local wine and the most fresh fish one could possibly find, provided by some local fishermen. We discussed about the village, about the difficulties they face to transfer goods and products, about their lives, about our strange trip. I admired them for the simplicity of their words, of their life. We continued talking late into the night, and we went to “bed” being grateful for meeting people who really know what generosity is all about. Next morning was covered with doubts about leaving the place or not. We finally decided to pack again and move to the other side of the island. Some of us regretted this decision for the route we followed was quite exhausting. 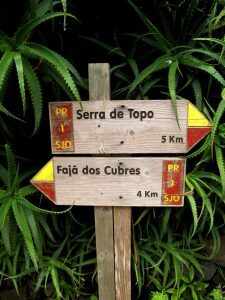 We had to ascend from sea level to Serra de Topo, a small peak 857 meters high, via a path which in the beginning seemed easy but then it got really steep. The weather changed rapidly and we had to rush to the peak while our-not so professional-backpacks made things even worse. Regardless, the view of the shiny blue ocean in contrast with the lush greenery that surrounded us were worth crossing a thousand paths like it. After arriving at the peak, we continued walking for some kilometers completely immersed in a cloud but when we reached the south part of São Jorge the sun was waiting for us. 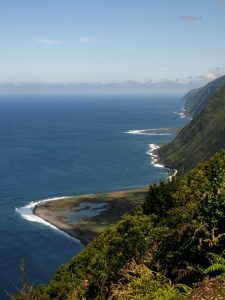 Our next destination was Fajã de São João and it was quite far, but several people stopped to pick us up and it didn´t take us long to arrive there. The sun started setting the moment we descended to our new camp site, rewarding us with the most beautiful colors which calmed both mind and body. Once at the Fajã, the task of finding a place to settle down proved easy. What is more, a farmer showed us around his vineyards which were made with enormous effort up on the hill by the traditional way of gathering stones to prevent land erosion. “If you ever need a job, I always need some hands here”, he said and you could notice a glint in everyone’s eyes. “What are you offering?” someone asked. “Home, food and plenty of wine, should be enough to live by” came the answer. We looked at each other smiling. It felt more than enough. The farmer’s wine along with the few things we had to eat tasted like the most gourmet dinner around the blazing logs. While discussing and listening to all kinds of stories the wine can make you tell, I was absorbed by my own thoughts. I couldn’t express how I felt but I could see on my partners’ faces that they were feeling the same: the happiness of knowing that there are still people out there with pure intentions to help and make you feel like home, and the relief of being happy with the simplest things in the world. Sleeping with that feeling was what made my world change forever.